China has seized 72 tonnes of milk powder believed to be tainted with melamine and is searching for another 100 tonnes, state media has reported. 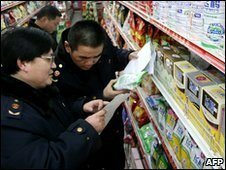 The powder is thought to be from a batch recalled after it killed six children in 2008 and made 300,000 ill.
Two dairies were shut down at the weekend after they were found to be selling products using the powder, which should have been destroyed. The melamine had been added to milk to artificially boost protein levels. China Daily said the Ningxia Tiantian dairy was shut down on Saturday after it was found to have processed and repackaged 170 tonnes of milk powder in its products. The powder should have been destroyed following the 2008 scandal but had been given to the dairy by another company as debt payment. Ningxia Tiantian then sold their products on to five other factories in Fujian and Guangdong provinces and in the Inner Mongolia autonomous region, said China Daily. Only 72 tonnes of the product has so far been traced - the remainder is believed to still be in circulation. Another company, Ningxia Panda Dairy, was closed because of its ties to a diary which was closed late last year. The latest seizures were part of a 10-day crackdown by the Chinese authorities on any remaining products containing the tainted powder. Zhao Shuming, secretary-general of the Ningxia Dairy Industry Association, told China Daily many small companies could not afford the equipment to test for melamine. He warned that some dairies could simply hold back powder that could potentially be tainted until the current round of checks had finished. In late 2008, the government ordered 22 firms implicated in the scandal to pay millions of dollars in compensation to the families affected by the contaminated milk. In November, two people were executed for their involvement in the scandal.